For as often as we’ve been to France, we still have never been to the Eiffel Tower. We’ve walked past it — and were nearly hustled by a team of pickpockets. The first, meant to distract us, walked quickly past us from behind, leaned over to pick up a shiny object from the sidewalk in front of us, and asked “Is this yours?” Meanwhile, his confederates, leaning against a wall to our left began to stir and move toward us. We had been warned of this scam, so I pointed at the youth meant to distract us and said, “Voleur.” He didn’t object or even react, but simply turned quickly to find another mark. 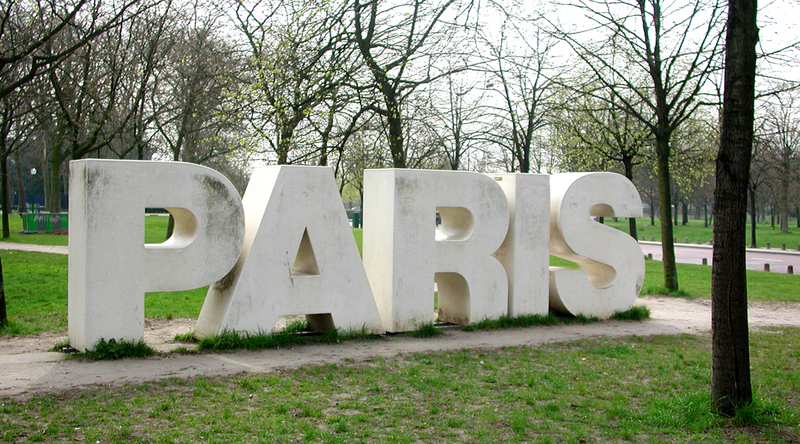 But we’ve been to many places normal tourists don’t find: out-of-the-way streets, the guignol puppet show on the Champs de Mars, and the parenthetical “forests” — the Bois de Boulogne and the Bois de Vincennes, one on the east and one on the west of the city. And we’ve eaten our way across the town, trying everything from Indian food to Chinese to a McDonalds (just to see the difference). Paris is a city of heads. It seems over every door, or at the corner of every cornice is a head. Sometimes a Pan head, sometimes a kingly head, sometimes, as at the Opera, the Palais Garnier, it is the head of every mediocrity who ever composed an opera: Halevy, Spontini, Adam, and a dozen others. Yes, they have Beethoven and Mozart, too, but they seem to be there only to provide caché for the hacks. We took the metro up to the opera because I thought I might be able to find the street and hotel I stayed at in 1965. But it was futile. Nothing looked right. Perhaps I stayed near some other opera house. Or maybe it was a railway station. It’s hard to tell the difference here: All the official architecture is monumental and any of it built before Francois Mitterand seems to be Baroque or Beaux Arts, and covered with rocaille, stone wreaths, volutes, acanthus and — most of all — heads. 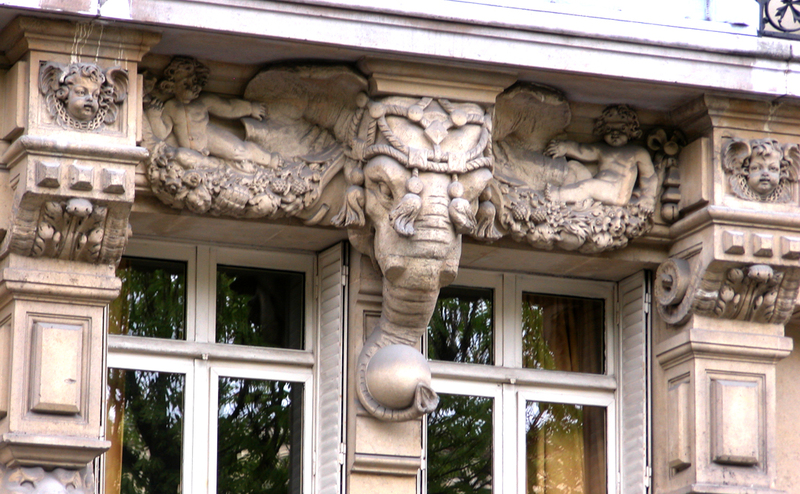 Just walking down the street, apartment buildings have volutes supporting the cornices of their doorways, and often a medallion just above the lintel with the head of a grotesque or a muse. And it isn’t only heads. There are caryatids and bas-reliefs, usually with some mythological import. Ovid seems so much more alive here than you would ever know in America. 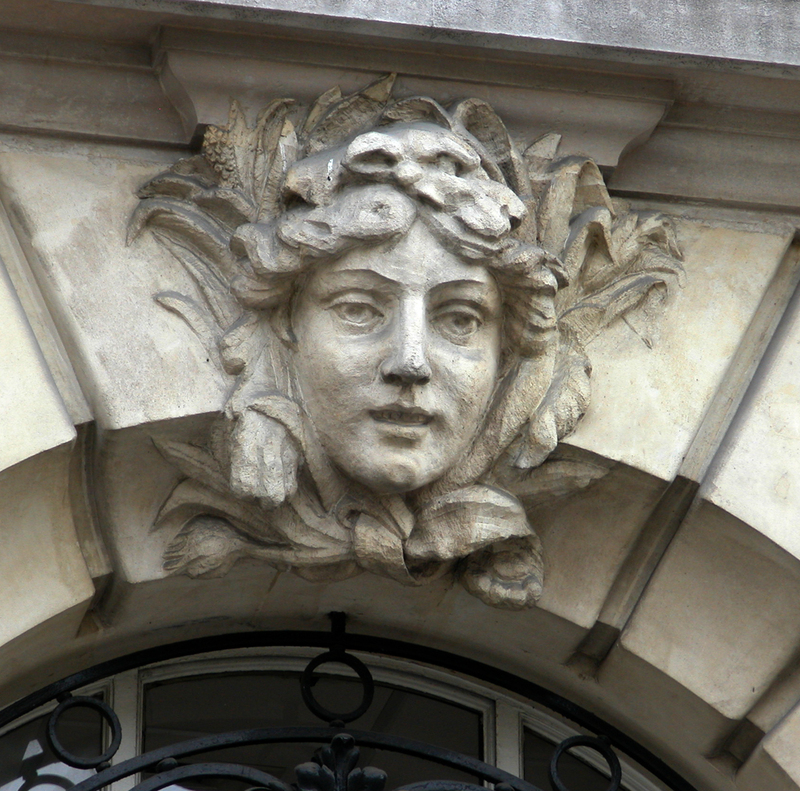 At home, no one under the age of 50 knows what the Metamorphoses is, or who its author was, but in Paris, when you go to the grocery store, there is Daphne or Syrinx staring at you from above the door. Further, when it isn’t a definable character — a muse or an Olympian — it is one of those ever-repeating European stereotypes: the satyr, the putto, the nymph. 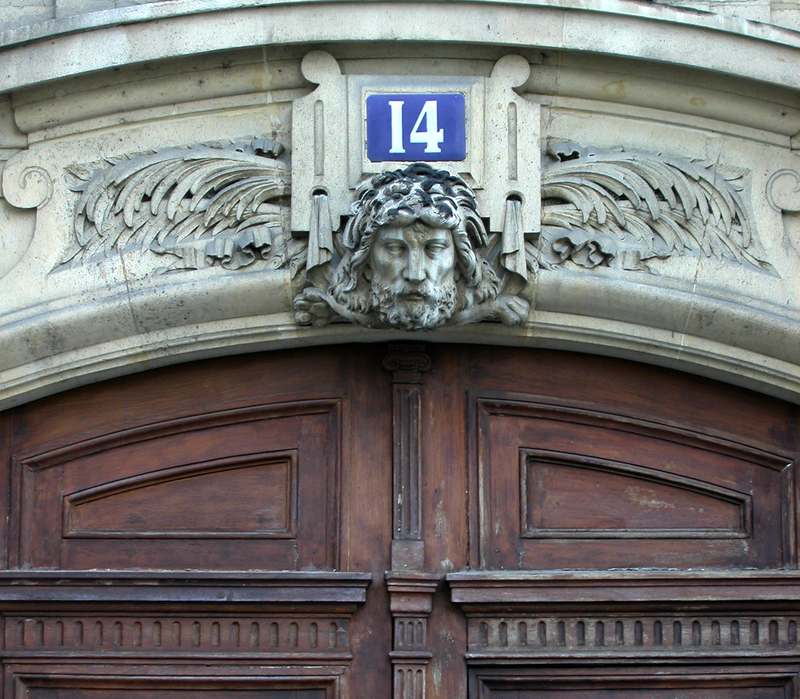 The Classical world cannot be easily forgotten in Paris, with so much architecture to keep it alive. In America, we are used to statues only on New England town squares, opposite the white-steepled church, or scattered through Washington, D.C., or at Civil War battlegrounds. 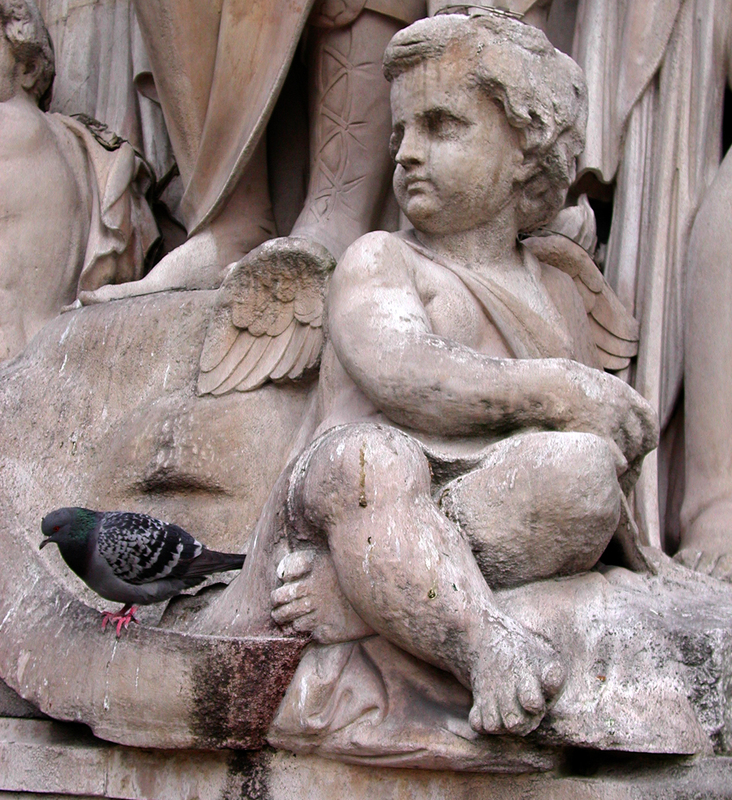 Statues are not part of the everyday experience of most of us. But in Paris, they are everywhere. Every park is full of classical Neptunes or Junos or Napoleonic generals. There are fountains with water nymphs and curlicue fish spouting water from their mouths. It means, among other things, that art is not just something you go to the museum to see, but rather, a way to give directions: “Turn left at the statue of Leon Blum.” The statuary means that the ordinary Parisian (as if there were such a thing) lives in a world in which antiquity is not only still alive, it is the visual language of everyday. 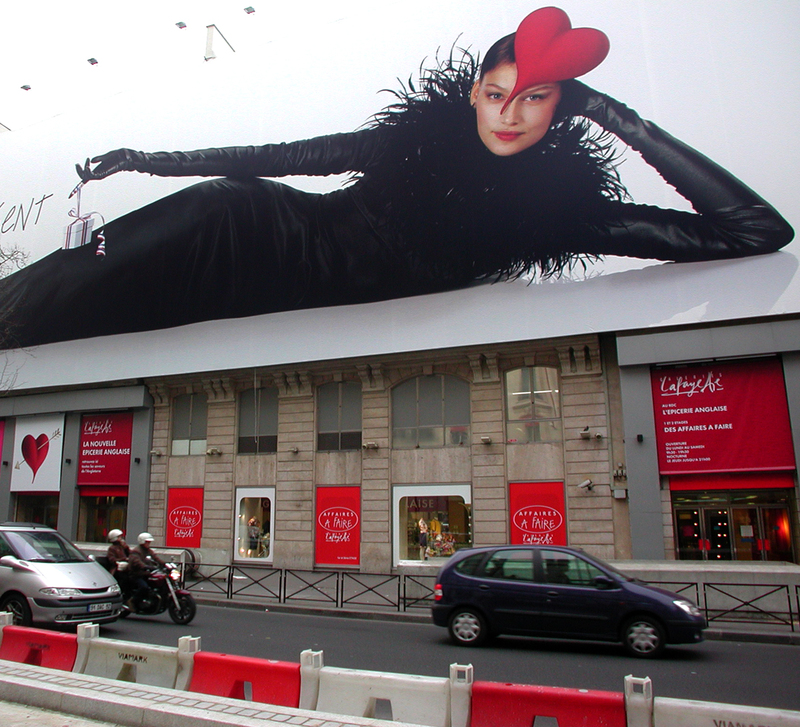 If the American eye is trained on commercial signage and corporate logos, the French eye is trained on the muscles of Theseus, the helmet of Ulysses, the straight nose of Artemis, the bust of Venus. There are putti galore, and wistful angels, of both genders, and flaming swords of St. Michael. It is all a great stew of history, art, religion and tradition. We took the RER to the Bois de Vincennes, but the day, which had been gloriously overcast, broke out in dappling sunlight and ruined any possibility I had of photographing the trees. 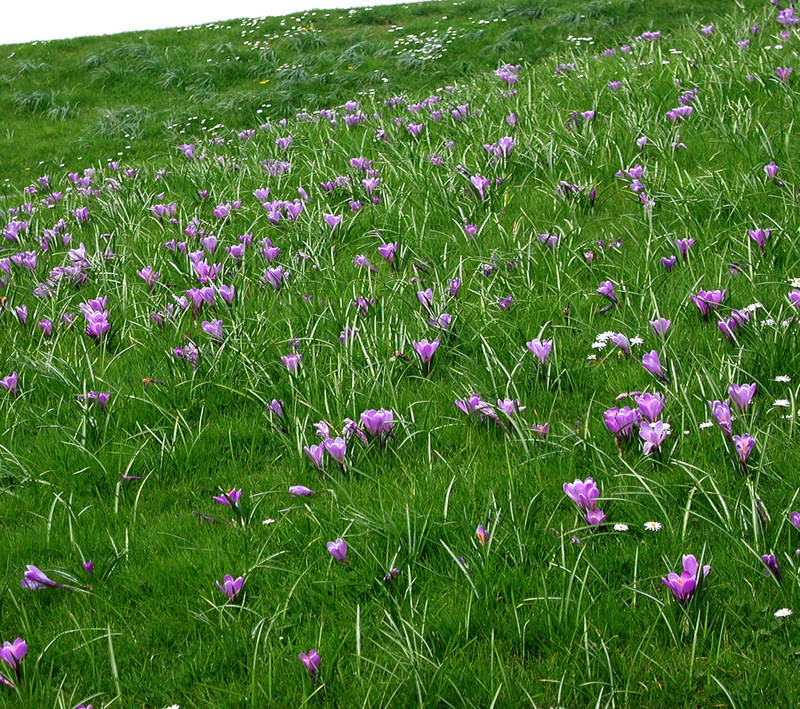 There was the Parc Floral, though, and it was filled with blossoms, even at this early point in the year. Carole noticed — and she is certainly correct — that the lawns are filled with little flowers in exactly the same way that the tapestries are filled in their millefleur designs. One place, in particular, was a slope, reducing the effect of perspective, so that the flowers, spotted evenly across the grass, was even more like the textiles. 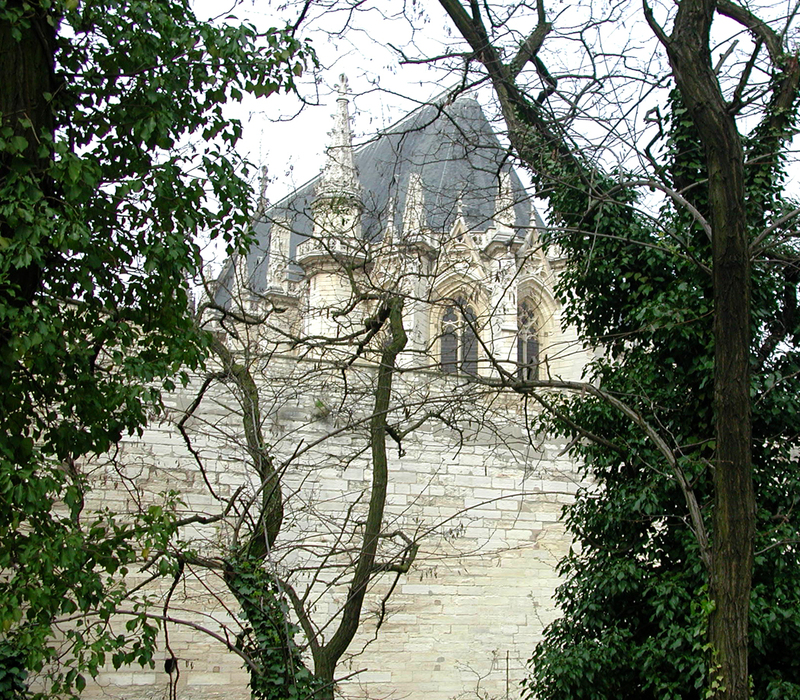 It was uncanny, and reminds us once again, how naturalistic — in their way — were the Gothic designers and artists. I had trouble reading a legend on our subway map and Carole hailed a passing woman for help. Her name turned out to be Marie Ifrah and she might as well be a lifelong friend now. She is Spanish, living in Paris and couldn’t have been more friendly and open. I mentioned that everyone we had met in Paris has been “tres amical,” but was surprised, because she says that Parisians are not always to open to outsiders. We talked for nearly an hour, in a macaronic melange of English, French and Spanish. Oddly, when we couldn’t understand a word, or she couldn’t remember one, Spanish became our lingua franca, and I was surprised to discover how comfortable I felt in Spanish. 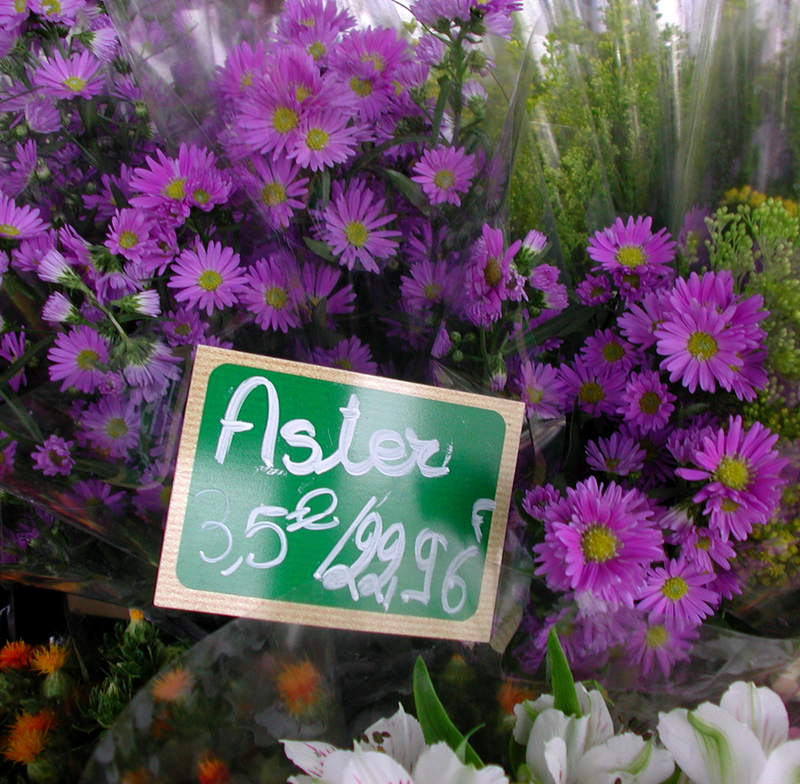 French is still a trial for me, though I’m getting better — speaking it, that is; understanding it is tough. But Spanish almost felt like a home tongue. We agreed that Americans are naive as a people, but disagreed about whether that is a good thing. She felt it is, that it is America’s naivete that is its salvation. At any rate, she couldn’t help us with the map, but we became fast friends, in a macaronic way, and planned to phone each other “sometime” to arrange a trip in her car to Montmartre, which she tells us is wonderful. She also pointed out that the French are steeped in culture. That the opera, the theater and such, are as bread and butter. Not like the Americans, she said. She didn’t want to insult us, so she pussyfooted around the issue, but America is all cuisine rapide, she hinted, and bang-bang movies. Les Americaines lack the discipline, she said. There are things she disapproves of in the French, but she admires their discipline. 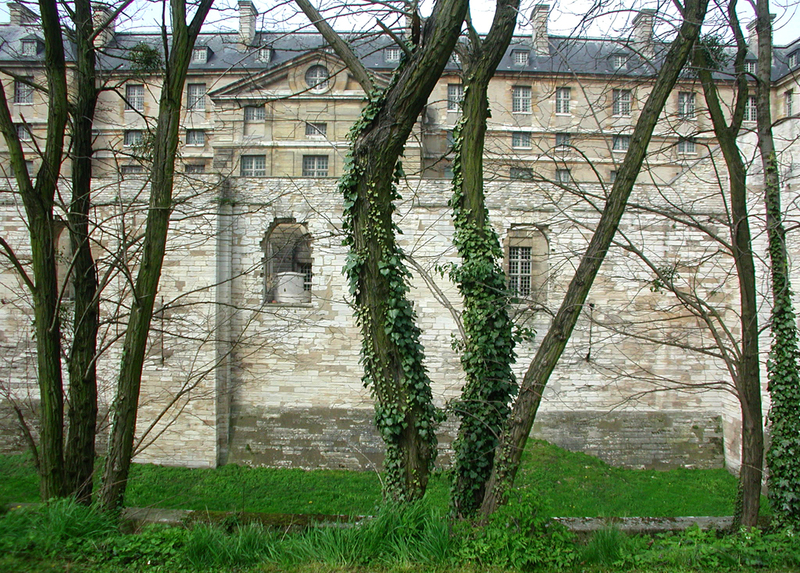 We didn’t expect the chateau at Vincennes; we came for woods. The palace was a surprise. But it is extensive and old. We walked through the grounds, but didn’t get into any of the buildings. Many are closed for restoration, and others were only open for tour groups and at hours that were inconvenient for us. But the Sainte-Chapelle there was a delight of Gothique flamboyant, with a huge Rose window, all out of proportion to its width. Because we had to walk all the way around the chateau grounds — and they are extensive — we had a late dejeuner, but it was worth it. We tried a little Italian restaurant in Vincennes, and had le menu, with an entree, plat and dessert. I had the mortadella, which Carole called “the world’s best bologna,” but she had several bites and seemed to enjoy it. Her own entree was the oeufes mayonnaise. We both had the lasagne boulognese, and it was rich with cheese. It only got better with the chocolate mousse that was so dusky you could have parked a truck on it. It is 11 p.m. as I write this and lunch is still with us, but in a good way. It feels silly writing about our food every day, but it is truly a highlight. 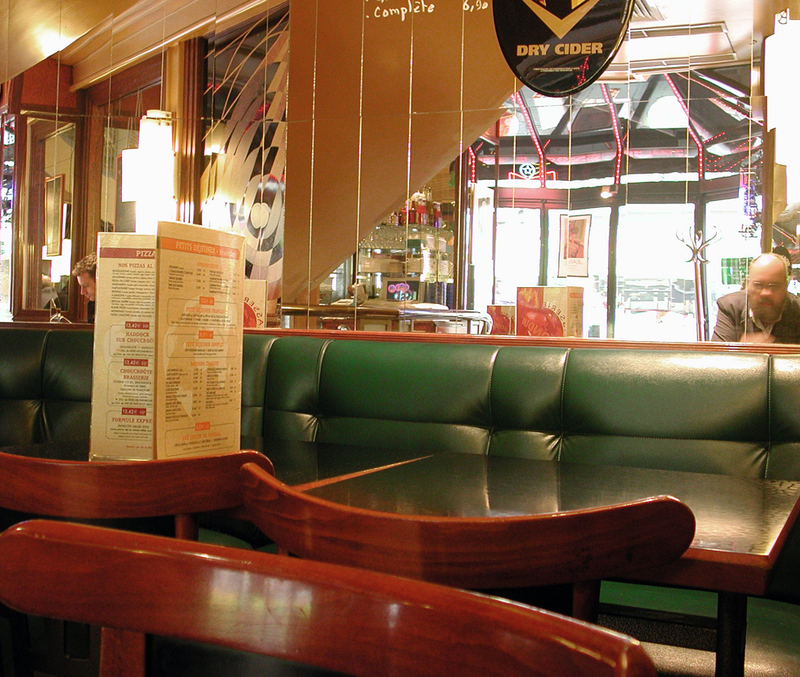 Paris is a city where your lunchtime conversation is likely to be about where you will eat dinner. In the evening, I took a walk around the neighborhood to snap out of a drowse fit. 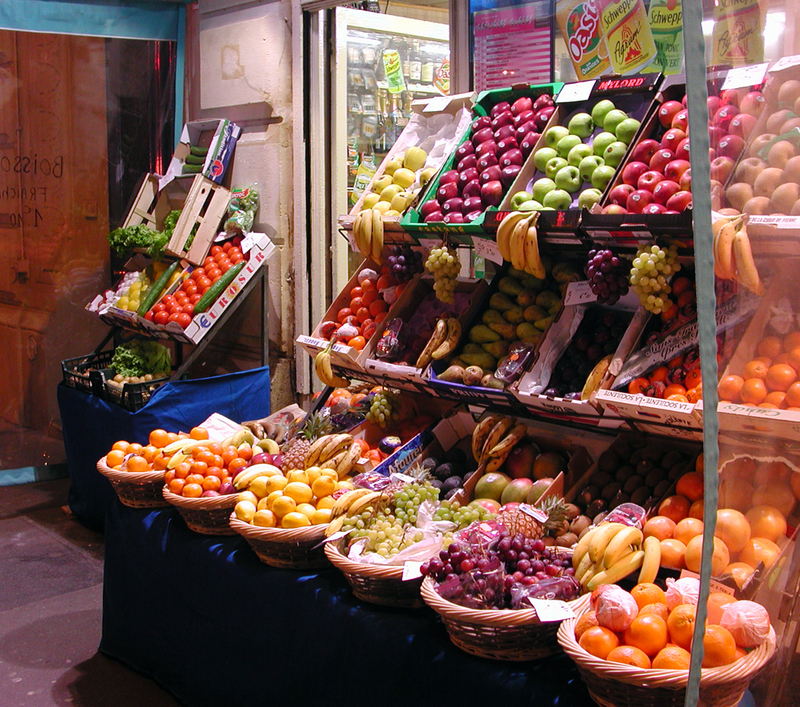 Took beaucoup photos and stopped at the supermarket for a loaf of bread and some confiture so Carole wouldn’t have to take her medicine on an empty stomach. So enlightening and thrilling to look at the grass and wildflowers and see that the millefleurs are real, truthful expressions of the ground here. The flowers I saw that are precisely the ones in the tapestries are the little daisies, violets, and a little plant I call rabbit plant, but I think it’s plantain, and a little pink flower I recognized. I loved seeing the castle because it was like the white castles in the books of hours I’ve seen before. And I loved walking in the woods in the places where the horses feet fell when the king went hunting. I found a flint arrowhead and wonder if it is one and is from the stone age. In the courtyard at the palace, it was easy to picture all the royalty there coming in on horses or in carriages. Seeing all these ACTUAL places and scenes that were only conceptual to me before; now they seem real human. 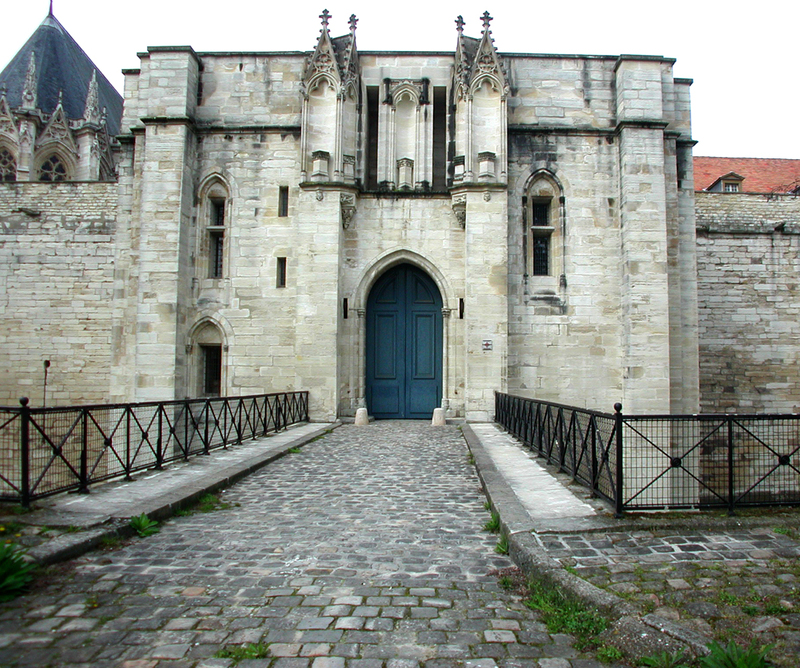 Also, I’d like to know why the church was so important to the king that he had such a huge and fancy chapel there at the palace. The lasagne was incredible, with bechamel sauce in it. The chocolate mousse was actually a religious experience. The wonderful lady we met, Marie. The poissonerie, with all the fish. I am surprised that the women here do not have coiffures; they all seem to have medium short hair pulled back with a rubber band or clasp. But even so, they look chic, and almost every woman is wearing a dress-length fitted black coat. But no curls. And today, I got a rose. It was a quiet day in Lake Woebegone, which leaves lunch as the high point of the day, with the mortadella entree, tres riches lasagne and the chocolate mousse. For the second day, we didn’t eat supper because the lunch was so overwhelming. The Bois de Vincennes was disappointing because the sun was out, making too many shadows for good photography, but the flowers were ecstatic. Walking around the neighborhood after dark was good, too.